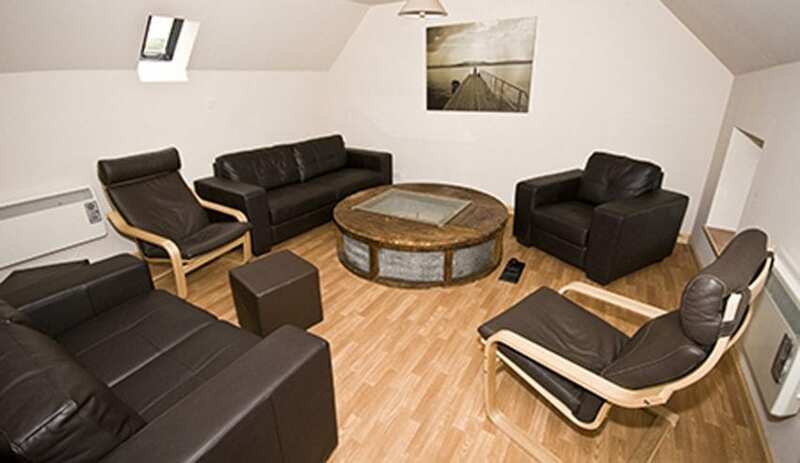 Cornmill Bunkhouse is situated on a traditional croft which has been in the family for many generations. The croft runs ewes, spring-calving cows, and grows winter feed and woodland. The mill was built in the early 1800s and was active until around 1926. It has been converted into 4 star affordable and comfortable accommodation for individuals or groups. The bunkhouse can sleep up to 14 people. It has a large self-catering kitchen and open-plan sitting room on the first floor, in which the old grinding wheel now serves as a coffee table. There is level access to the first floor at the rear of the building, with an easy going stair down to the ground floor, which has two bunk rooms, a disabled access toilet/wetroom and a toilet with a shower. The first bunk room sleeps 8. The second sleeps 6 and has a patio door looking onto the workings of the old mill with its large wooden cog driving wheels. 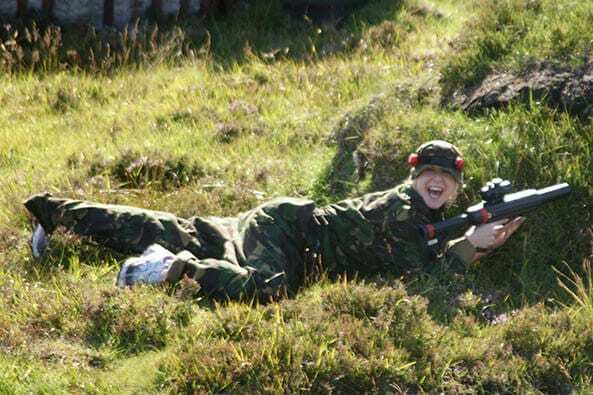 Activities can be organised for groups including Laser Tagging, and Claypigeon Shooting. Hen and stag parties welcome. Come and enjoy this historic setting. 4 star tourist board graded. This accommodation is featured on our map of North East Highlands of Scotland and here is its own website. All year, advanced notice required 1st Oct - 1st April. All day. £18 per person. Discounts available for group bookings. Please enquire for availability by phone or email. 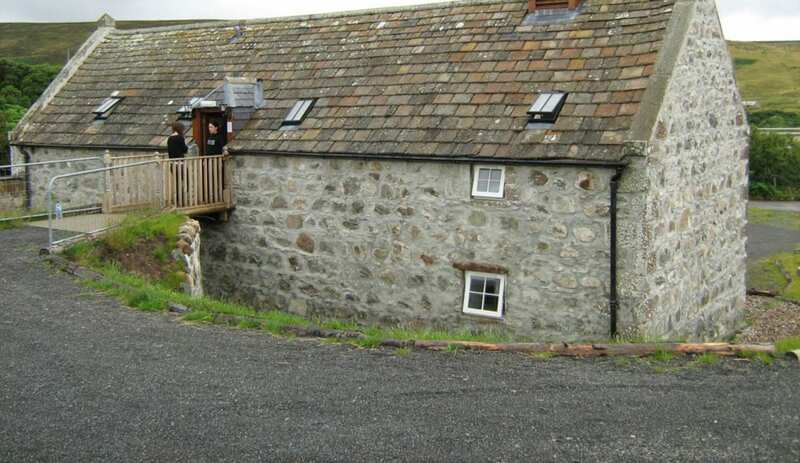 The Cornmill Bunkhouse is located on the A897, 6 miles from Melvich, 20 miles to Thurso, 42 miles to John O'Groats and 34 miles to Helmsdale. Forsinard railway station is only 10 miles away. The line runs from Inverness to Wick, stopping at Forsinard three times a day. This accommodation is by the sea, is available to individuals and is on the IHUK signage page, the Hostels that welcome stag and hen parties map and the North Coast 500. As good as paintball but without the bruises. Cornmill Laser Combat is a unique sport for 8 year old to 80 year old for 2 teams up to 7 a side. This equipment has been imported from the USA and is very high tech with a capability of a range of over 200 metres, it is played on a man-made course with a fort at each end and plenty of cover and the object of the game is to shoot out the other team. Each player starts each game with 10 lives and 1,200 rounds of ammunition. Each game lasts up to 20 minutes and each package will have around 6 games. This is ideal for Stag/Hen and Birthday parties or a family outing and when linked in with a stay in the Bunkhouse can make an ideal short-stay holiday. Bookings for groups of 6 to 21 with a price of £25 per adult and £20 per child (under 12). Clay Pigeon Shooting is also available and is an oppotunity to have a go at real shooting with 10 bird “Down The Line’ and 10 bird “Over The Top” for only £25 per person. There are many different options for LEJOG using the National Cycle Network. Passing the Cornmill Bunkhouse, where you can be sure of a welcome and a good nights rest, has got to be one of the best. There is no official Sustrans route for LEJOG: Lands End to John o’Groats. However using the National Cycle Network to cycle End to End passing Cornmill Bunkhouse is a good option. 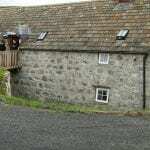 The Corn mill Bunkhouse in run by a Crofter who converted a fine corn mill into a hostel that can accommodate up to 16 people. The upper floor is where the kitchen lounge and dining area is. One of our readers described the kitchen as the best she has seen. The building retains many features of the original Corn Mill. It is only four miles off the North Coast 500 route and is well worth the detour. If you are cycling Lands End to John O Groats you can go right past the door, although we would advise calling in for the night. Sandy and Debbie Murray welcome you to the Corn Mill Bunkhouse! Built in the early 1800s by Sandy’s ancestors to mill oats for the crofters of Halladale, Reay and Melvich. Now, over 200 years later, is providing affordable and comfortable accommodation for individuals or groups visiting the beautiful Strathhalladale area of Sutherland, in the north-west Highlands of Scotland.